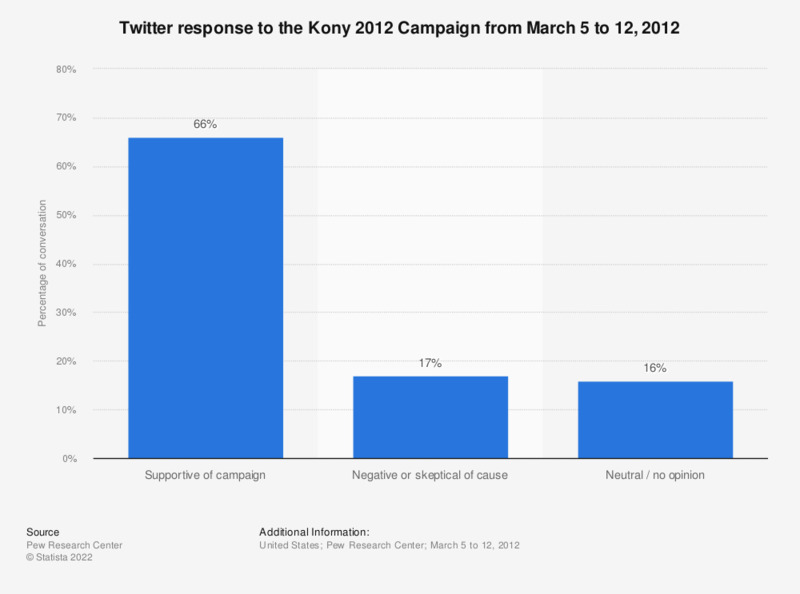 This statistic shows the social media response to the Kony 2012 social video campaign. After the release of the Kony 2012 film, 66 percent of the Twitter conversation from March 5 to 12 supported the anti-Kony campaign. Kony 2012 is a short film created to promote the "Stop Kony" movement to make Ugandan indicted war criminal and International Criminal Court fugitive Joseph Kony globally known in order to have him arrested by December 2012, the time when the campaign expires. The analysis of the tone of conversation on Twitter utilizes coding procedures created by the Pew Research Center’s Project for Excellence in Journalism along with computer technology from the media monitoring firm Crimson Hexagon. This analysis is based on an examination of more than 5.4 million tweets related to the Kony 2012 movement. Do you use Twitter before, during, or after to react on a TV program?